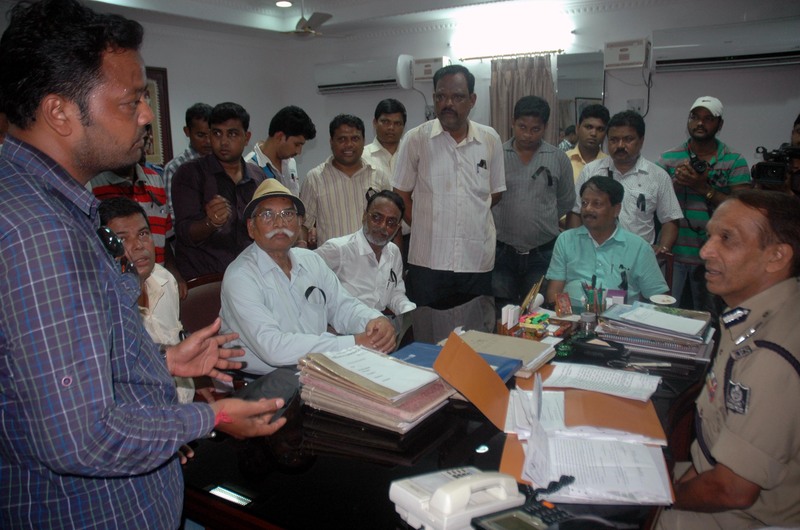 Cuttack based scribes belonging to both the print and electronic media, in a signed memorandum to Orissa’s Director General of Police today stressed on action against medicos who kidnapped two reporters of Naxatra News from the medicine indoor of SCB Medical College on June 15 and tortured them in wrongful confinement for more than two hours. They also demanded stern action against the inspector-in-charge of Police of Mangalabag PS for discernible siding with the rowdy medicos. 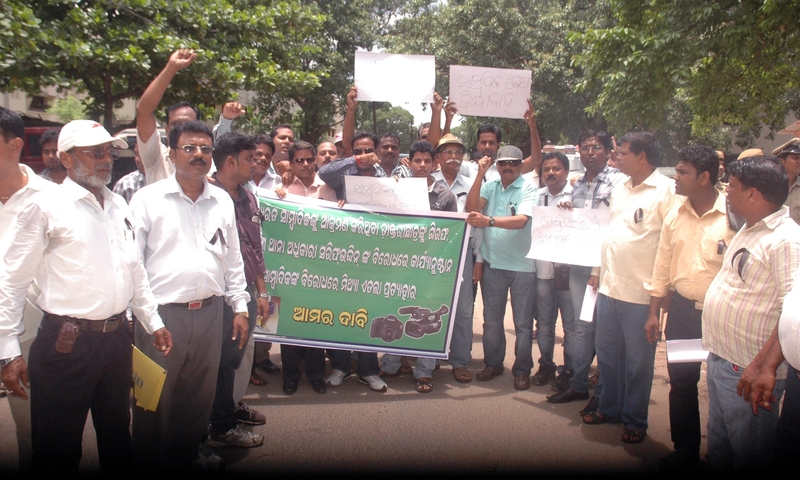 Members of the presidium of Media Unity for Freedom of Press (MUFP) Prasanta Patnaik and Subhas Chandra Pattanayak and coordinator of Save the Samaja Forum Pabitra Maharatha accompanied the aggrieved scribes in a major rally to Police headquarters. In absence of the DGP, the memorandum was received by Additional DGP Mr. Sanjib Marik. The tortured scribes, Chittaranjan Samantray and Debasis Mohanty gave a detail description of how they were shanghaied into wrongful confinement in a hostel of the medical college by a gang of around a hundred medical students and interns and physically tortured. They were forced to kneel down for hours and then forced to proceed to the same medicine indoor for begging apology before the indoor patients before whom on June 14 they had raised objections to what the house surgeons had said about the father of Samantray. Samantray’s father was admitted into the medicine ward for treatment. The house surgeons pronounced that the senior Samantray had developed damage in both his kidneys and insisted that he should be shifted to a private hospital. Samantray was shocked, because no pathological investigation had indicated about any damage to the kidneys and he protested. This irked the house surgeons and they started rebuking him in filthy language. An embarrassed and shocked Samantray tried to capture the highly atrocious conduct of the medicos; but obstructed, he went to the unit head and professor of medicine, Dr. Siddharth Das and placed before him his grievances. Dr. Das rushed to the spot and investigated into the matter and as all co-patients of the indoor ward corroborated the allegations raised by Samantray, asked the errant medicos not to work in the same ward. This further irritated the medicos. When next day, June 15, he had come to attend his father, his co-reporter Debasis had also come with him to meet the professor in his indoor chamber in matter of his ailing mother. Seeing them in the indoor corridor, the miscreant medicos jumped on them and whisked them away into the hostel, where they were kept in wrongful confinement and tortured. The gory part of the incident is that the IIC of Mangalabag Mr. Shariffudin having come to the spot on SOS message from the affected scribe remained a silent spectator of the torture and willfully neglected to register the FIR filed by them and was later seen entertaining the miscreant medicos in his chamber and registering a parallel FIR filed by them in order to create a confusion in course of criminal justice dispensation. About 50 scribes, while collectively presenting their Memorandum, informed the ADGP that the same IIC is terrorizing them and urged upon him to investigate into his conduct and discipline him. 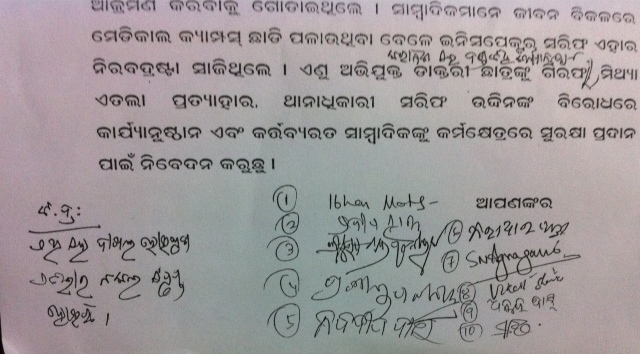 Besides the two victims of medico-police atrocity, the memorialists included, amongst others, Pradip Sahu,Navdeep Das,Cittaranjan Mishra, Satchidanand Behera, Gopal Mohapatra, Matrudatta Mohanty,Prasanta Mohanty, Jyotiprakash Rao, Bikash Sharma, Abhi Mohanty, Amardev Nayak, Rajkishore Panda, Pratap Chandra Sahoo, Devi Prasanna Khuntia, Rajkishore Mohanty, Ch. Jagannath Patra, Satyajit Mishra, Saroj Kumar Mallik,Ajaya Kumar Das, Pabitra Maharatha, Prasanta Patnaik and Subhas Chandra Pattanayak. The ADGP has assured to take suitable action in the matter and expeditiously. Law will take its own way……..sir. But law fails to “take its own way” if the prosecutor derails the prosecution. So the people must do everything to stop the law taking a wrong way. Assaults against journalists are unacceptable under any circumstances. Being a journalist I strongly condemn the attack on my friends by the medicos of SCB, Cuttack with a note on the role of a Sr. police officer of the Commissionerate Police who was being smitten over. It is well on records that a wave of attacks across Orissa that targeted journalists, have never been concluded to a free and fare inquiry. Why? On 15 June, the medicos reportedly forced their way into two of my media friends attacking and beating by confining them in the hostel campus. A call on from members of my fraternity, including of the Media Unity for Freedom of Press (MUFP) and Save the Samaja Forum “to ensure that media professionals are protected against all forms of intimidation and violence because of their opinions or thoughts.” should be heard upon by the DGP of the State as one of his Sr. officers is involved in instigating the medicos on assault upon scribes, Sri Chittaranjan Samantray and Sri Debasis Mohanty. The violence against journalists, as is being expressed by the sentinels of the world- has the dangerous impact of such incidents on press freedom and freedom of expression. June 15th attack has come on the heels of a growing trend of violence across the State, including a series of coordinated attacks earlier. I urge upon the Chief Minister of the State to ensure media independence, transparency and credibility, in order to secure the sanctity of the press freedom by an impartial inquiry into 15 June incident. Let all my friends of this fraternity get an environment to work. Thanks to orissamatters.com for always holding high support to the freedom of our fraternity.